Leads, basses and general sound module functionality. 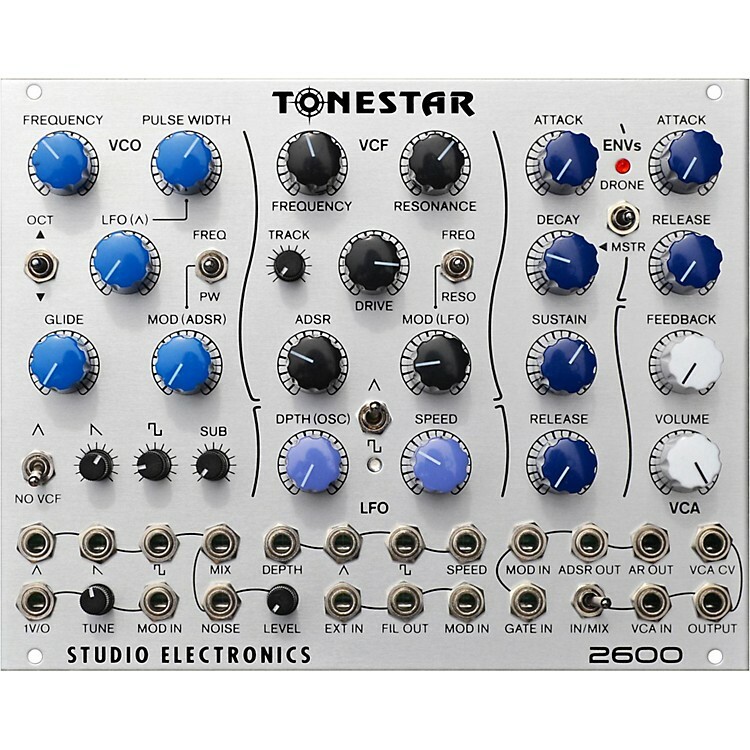 TONESTAR is an ARP® 2600-inspired synth voice, pre-patched like Pearlman's prodigy, and fully in-the-box modular, allowing for highpass/bandpass/notch filter tones, and bristling X-mod effects. Connect CV / gate and twist 'n' switch, or pull its tones and voltages apart one 3.5mm cord at a time. 26 knobs, 7 switches, and 21 jacks make for complex and satisfying signal flow, color and collisions. If it gets reedy, route the triangle wave around the VCF, and push that Sub. The VCO is the same as the Oscillation, the Boomstar, and the Omega. It's kind of a combination of Arp®, Oberheim® and Moog® circuits (sort of a greatest hits), time-tested, very stable—very good tracking over a very large range. This module is a TONESTAR—its own thing—and not a 2600 clone attempt; nevertheless, the Tone tugs lovingly at times on the sleeve of the 2600. It is a single oscillator, 2600 VCF, pre-patched and yet fully modular classic synth voice.. Its primary use would be as a go-to bassline/lead tool, or a premium quality, entry-level, complete synth module, for root-to-leaf sound design, and multiform analog exploration/expression. DRONE/MASTER – Indefinite/instant sustain, and master mode for ADSR routing switch. Center off. A great heart of your modular system. Order today.